About a week ago, I was attending a seminar. As I am wont to do, I brought my knitting, as I like to knit while listening to a lecture or participating in a group discussion. I actually listen better and retain more of the information in this way, as knitting activates both sides of the brain. I asked the lead lecturer if she was O.K. with me knitting while she talked. She said no. So I knitted during the breaks, when everyone was waiting for the next portion of the seminar to begin. I had planned to wear a beautiful peach lace shirt, but I felt that even though it was very feminine, it would look so much better if I made a peach ruffle scarf to top it off. I stayed up talking to a friend on Saturday night and finishing my peach scarf to wear to the seminar on Sunday. I had on white jeans, my peach lace shirt and fluffy peach scarf, a white jacket and comfortable shoes. I also wore a herkimer diamond necklace I had made for myself, but that was scarcely visible under my ruffles and jacket. Everywhere I went, everyone complimented my scarf. It was light peach, cream, khaki and salmon with gold thread interspersed. Finally, a woman approached me about purchasing my scarf for her mother. I wasn’t sure how well the peach yarn would turn out, so I had only purchased one skein. Silly me! I told the woman that I could order more peach yarn and have another scarf for her within the week. No. She wanted that one – the one I was wearing! She was set to see her mother over Easter weekend and wanted to take it to her immediately. The colors would be perfect for her mother, she explained. Finally, I relented. I literally sold the scarf off my neck. I also ended up selling the other scarf I made that weekend, a purplish-blue scarf with a green streak. This sort of thing does happen to me all the time, actually. Last year, I had sat on my porch with one of my dearest friends, a client who I had brought back to health after he had been sick and unable to be healed by any other methods for 20 years, and my client’s mother. I asked them whether or not I should sell my crafts. After all, someone was always admiring something I made and willing to pay good money for it. They explained to me that they felt that my gifts as a medical intuitive and holistic healer were so vitally needed that I should put all my efforts into helping others. It was fine to knit and make jewelry, they explained, but those should remain my hobbies. I continued to bead, make jewelry and knit. For me, these are mental health activities. The more stressed I am, the more I turn to my creative pursuits for solace. And when I truly want to unwind and relax, the colors of my art deeply soothe me. I can spend hours and hours or an entire day just making things. 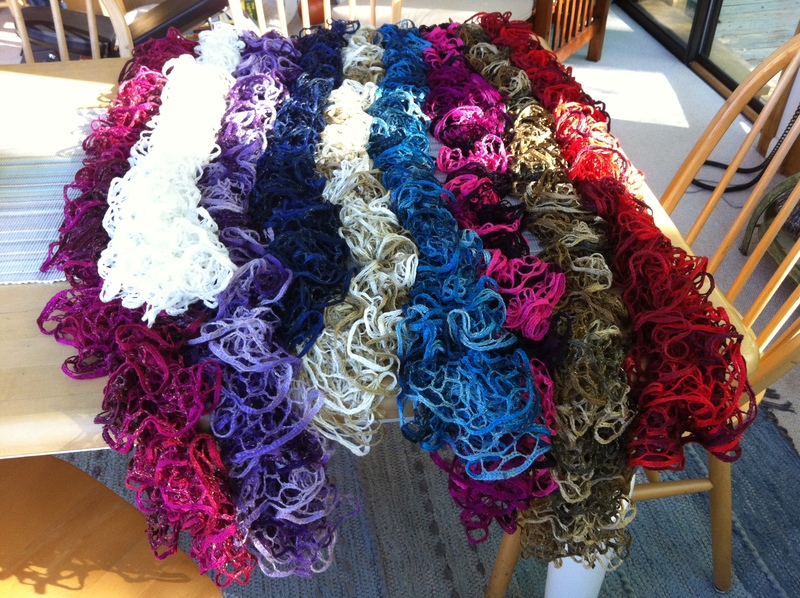 I love sitting in the fresh air and sunlight and making jewelry or knitting. Often, I think of the person I am beading or knitting for. I have so many friends and so many women clients and so many people who have been kind to me that I want to thank with a gift. I hear of friends who spend hours and days in meditation. Meditation and being quiet is an essential requirement for being intuitive. But for me, while I am feeding my soul with quiet I can also feed my soul with vibrant colors, real gemstones and creativity. As a result of my need for active meditation and my equal desire to thank my many friends, I end up with a rather large oeuvre. I get into high gear before Christmas and certain times of the year with multiple birthdays. And then often I just stay in high gear, especially when the weather is beautiful and I can sit on my porch for days. I am currently knitting green variations with a streak of navy. If there are other colors you would like, don’t hesitate to ask. Or perhaps you would like for me to make matching earrings, a bracelet or necklace to match a particular scarf. All scarves are $45. Please give me a ring at 678-612-8816 if you would like to order one. how long are your scarves?